Wednesday 5th, a misty damp morning, and we're off to Gros Morne - a UNESCO World Heritage Site - with breath taking views so I've read. Its a pleasant hour drive back around Deer Lake and then up the "Viking Trail" (also known at Route 430, but without the charm!). Once in Gros Morne, we stop to look across to water to Woody Point. This stretch of water includes "two arms, and a (the) tickle" - only in Newfoundland! We explore the Lobster Cove lighthouse and enjoy the views, and then drive back to Rocky Harbour, and stop at the "Fishermans Landing" cafe, which is a favourite for Dan & Kate, and we enjoy a "Newfie Mug Up" - which turns out to be a large mug of tea and toast with molasses - it was VERY good - a real treat! 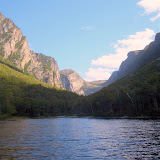 Then we drive a short distance up to Western Brook Pond - or rather the start of the trail to Western Brook Pond! Its a 3+km walk including the detour with extra views, to get to the boat tour, but we're up for it. Its an easy and safe walk, with lots of opportunities to enjoy the view and areas - along with frequent information signs, giving well written background on whats going on. We get to the boat area, and though we'd packed a small lunch, there is a kiosk selling the BEST hot dogs- really the best I've had, ever! Add to that a welcome hot chocolate, and I'm happy and not noticing the mist and damp. We could see that the visibility was not as good as it should be ... and had already decided to come back another day to get maximum impact, when the captain declared that they weren't going to sail that day, for the same reasons. Shame, but the walk alone was worth the effort. Looking forward to coming back. On our way back down the Viking Trail towards Deer Lake, I spotted a moose grazing between the road and the beach. What a treat! I've now seen a moose, just need an eagle to tick all the boxes! Back at the chalet, Kate cooks a huge fish pie ... another really good day.